영산전 벽화는 벽체와 포벽은 물론 내목도리 윗벽과 대량ㆍ창방 등 내ㆍ외부 전체에 고루 그려져 있으며, 그 내용 또한 매우 다양하게 구성되어 조선후기 사찰벽화의 백미라 할 수 있다. 외벽에는 총 17점의 벽화가 남아 있으나 현재 훼손이 심한 편해 윤곽이 뚜렷하게 드러나지는 않는다. 그러나 내부는 총 52면의 벽면에 벽화가 조성된 것을 알 수 있다. 하지만 서벽에 묘사된 『묘법연화경』 ｢견보탑품｣의 내용은 3면으로 분할되어 있으나 하나의 내용을 표현한 것이므로 한 장면으로 볼 경우 총 50장면의 벽화가 도상화되어 있다. 이 가운데 『묘법연화경』 ｢견보탑품｣의 내용과 불상 뒷벽의 상단에 그려진 운룡도를 제외하면 가장 많은 내용을 차지하는 것은 48면에 그려진 『석씨원류응화사적』의 내용을 표현한 벽화들이다. 이들 내부 벽화들은 『영산전천왕문양중창겸단확기문(靈山殿天王門兩重創兼丹雘記文)』의 현판을 토대로 살펴보면, 1715년에 총안(聰眼) 외 14명의 화사들이 그린 것으로 보인다. 1792년에 영산전의 단청을 중수한 기록이 남아있으나 내부 벽화들에서는 개채나 보수 흔적을 살필 수 없고, 훼손 시 떨어져 나온 벽화 층을 살펴봐도 동일한 1개의 안료층을 보이기 때문에 1714년부터 1716년까지 3년간 새로 영산전 건물을 중창할 당시에 조성한 것으로 판단된다. 내벽에서 가장 많은 내용을 담고 있는 것은 총 48면으로 이루어진 『석씨원류응화사적』 벽화이다. 이들 48점은 내부 운룡도를 제외한 동벽과 남ㆍ북 벽의 포벽 및 내목도리 윗벽, 견보탑품도와 협시청중도(脇侍聽衆圖) 2점을 제외한 서벽의 일부에 묘사되었다. 동벽의 경우 불상과 후불도, 운룡도가 있는 중심벽면을 제외한 좌우 4면의 공간에 묘사되었다. 남벽과 북벽의 경우에는 포작의 수에 따라 만들어진 포벽의 상ㆍ하단에 그려져 있는데 남벽에는 상 12점, 하 12점, 북벽에는 상 9점, 하 9점으로 남ㆍ북 벽면 모두 총 42점의 벽화가 있다. 서벽에는 『묘법연화경』 ｢견보탑품｣의 내용이 담긴 중심벽면과 권속들을 그린 좌우 하단의 벽면을 제외한 상단의 장방형 벽면 2면에 『석씨원류응화사적』의 이야기가 그려져 있다. 주제별로는 내목도리 윗벽의 대부분이 『석씨원류응화사적』의 1ㆍ2권에 나오는 석가모니의 행적들이 그려졌으며, 동ㆍ서측의 하단면을 제외한 남ㆍ북측의 하단에는 3권에 나오는 고승들의 사적들을 묘사하였다. 우선 벽화는 석가여래가 영취산에서 설법할 때 다보여래의 탑이 땅에서 솟아나 설법을 찬탄하니 그 탑안으로 석가여래가 들어가 다보여래와 같이 앉았다는 『묘법연화경』제11품 「견보탑품」의 내용을 장엄하게 묘사한 국내 유일의 벽화이다. 특히 세밀한 인물표현, 유려한 필선, 안정된 구도, 부드럽고 장엄한 색조 등에서도 뛰어난 화격을 보여준다. 는 영산전 내부 동서남북의 상벽과 포벽에 그려졌다. 상벽의 직사각형 화면에 그려진 25장면의 벽화는 모두 석가모니불과 관련된 것들이고, 이에 대응되게 그려진 하단의 凸자형 포벽에 그려진 벽화는 주로 고승들의 행적과 관련된 것들이다. 이러한 수직적인 배치는 붓다와 제자간의 위계를 고려한 배치로 여겨진다. 필선, 인물의 묘사, 채색 등 화풍에서 와 동일시기에 그려진 것으로 생각된다. 영산전 내벽에 그려진 벽화는 국내유일의 견보탑품 벽화라는데 그 가치를 높게 평가할 수 있다. 벽화 역시 조선후기 팔상도에 포함된 목판의 설화내용 보다 비교적 풍부한 내용을 담고 있어 의 부족한 도해 내용을 보완해 주고 있다는 데서 큰 의의가 있다. 또한 화면마다 화제를 남기고 있어 벽화의 도상 이해 제고에 자료적 가치를 더 해준다. 영산전 벽화는 화풍에서도 밝고 부드러운 중간 색조를 사용한 점이나 단아하고 세밀한 인물묘사, 끊김 없이 처리한 유려한 필선, 안정된 구도 등에서 17세기 초반의 불화들과 비교된다. 또한 영산전 내부벽화는 1716년에 쓰여진「영산전천왕문양중창겸단확기문」이나 여타 중창관련 자료들을 통해서도, 1713년 화재로 영산전이 소실된 이후 1714년부터 1716년에 걸쳐 이루어진 일련의 중창불사 과정에서 이 벽화도 그려졌을 것으로 보인다. 이 벽화는 분명한 소의경전과 예술적 작품성, 종교적 감수성, 시대성 등을 두루 갖춘 18세기 초 벽화의 기준자료이자 이 시기 벽화를 대표할 수 있는 작품이다. The murals in Yeongsanjeon Hall of Tongdosa Temple, a large group of murals on richly-varied themes, are rightfully considered to be masterpieces of late Joseon temple mural painting. The murals in Yeongsanjeon Hall are not just painted on walls proper, but also on exposed beams and other surrounding structural pieces. 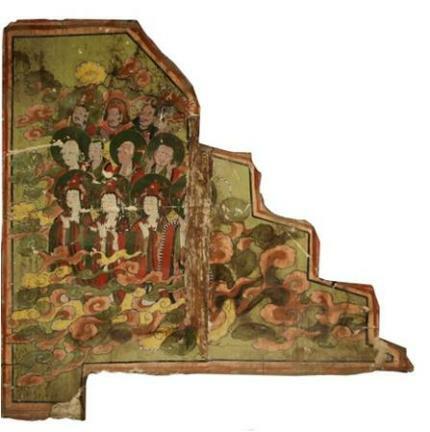 Seventeen of exterior wall murals of Yeongsanjeon Hall have survived to the present, although many of them are too damaged to clearly make out the images represented. Inside the building, there are fifty-two murals in number of wall panels, and fifty murals in number of scenes depicted, as the scene from the “Vision of the Bejeweled Stupa” of the Saddharmapundarika Sutra (The Lotus Sutra) on the western wall, occupies three adjoining wall panels. 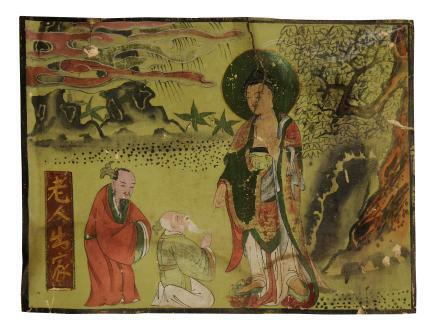 All forty-eight wall panels, except the scene from the “Vision of the Bejeweled Stupa” of the Saddharmapundarika Sutra and the painting featuring dragons and clouds, placed behind the Buddha statues, represent scenes from Seokssi wollyu eunghwa sajeok (Life and Activities of Sakyamuni Buddha Incarnate). These murals inside Yeongsanjeon Hall were painted, according to the information carved on a wooden tablet, in 1715 by fourteen monk painters including Chongan. 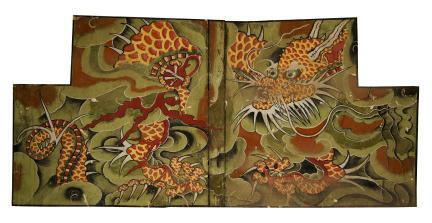 Meanwhile, although there is a record indicating that the ornamental painting (dancheong) of Yeongsanjeon was redone in 1792, the murals show no traces of having been retouched. 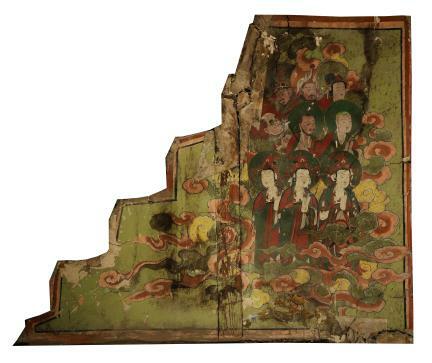 The examination of the fragments fallen off the murals also shows a single paint player. The indoor murals, therefore, appear to have been painted during the three year period between 1714 and 1716 during the renovation of Yeongsanjeon Hall. The entire eastern wall, except one wall panel representing the image of dragons amid clouds, is devoted to scenes from the ‘Life and Activities of Sakyamuni Buddha Incarnate.’ Scenes from the ‘Life and Activities of Sakyamuni Buddha Incarnate’ are also represented on the northern and southern walls, and on the section of the western wall, excluding the panels representing the ‘Vision of the Bejeweled Stupa’ and the scene of the assembly at a sermon. The northern and southern walls are divided vertically into several panels by columnar brackets, then divided again horizontally by the purlin between two bracket sets, into upper and lower halves. There are therefore, twelve murals in the upper-level panels of the southern wall, and twelve others in the lower-level panels. In the northern wall, meanwhile, there are nine murals at the upper level, and nine others at the lower level. 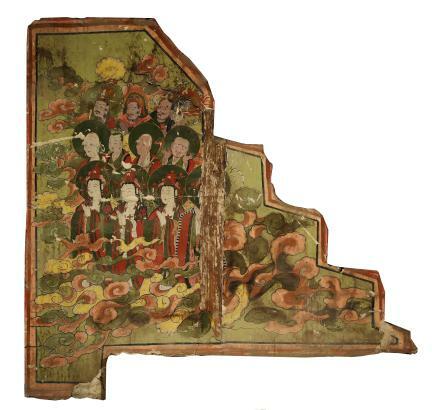 In the western wall, scenes from the ‘Life and Activities of Sakyamuni Buddha Incarnate’ are painted on two rectangular upper-level panels, while the central panel is devoted to the “Vision of the Bejeweled Stupa” and two low-level panels to the image of Buddha’s retinue. Most upper panels, located above the purlins, feature scenes from the story of Sakyamuni Buddha’s life, told in the 1st and 2nd volumes of the ‘Life and Activities of Sakyamuni Buddha Incarnate,’ while the lower panels on the north and south walls display scenes from the accounts of the lives of ancient monks, told in the 3rd volume. 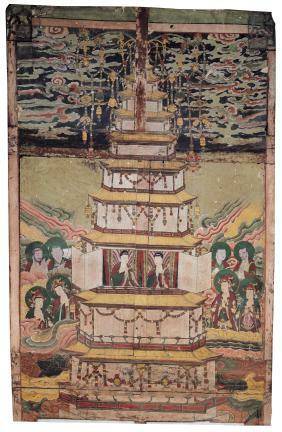 The Vision of the Bejeweled Stupa, the only surviving mural on this theme in Korea, depicts the story in which when Sakyamuni Buddha gave a sermon on the Vulture Peak, a stupa of Prabhutaratna (Buddha of Abundant Treasures) rose from the ground, moved by the sermon, and Sakyamuni entered the stupa and sat next to the Buddha of Abundant Treasures. 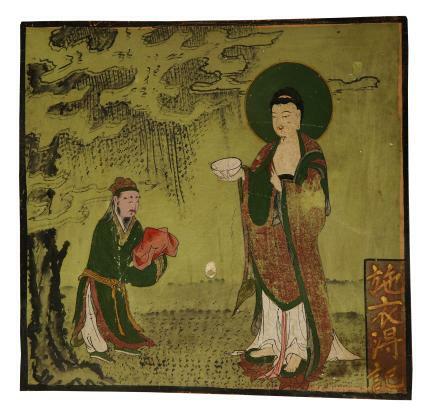 Figures in this mural are rendered in elegant brushwork and are meticulously depicted. The composition is outstanding, and the color tone is soft yet solemn. As for the murals on scenes from the ‘Life and Activities of Sakyamuni Buddha Incarnate,’ twenty-five scenes, painted on the rectangular upper wall panels above the purlins are all related to the life of Sakyamuni Buddha. 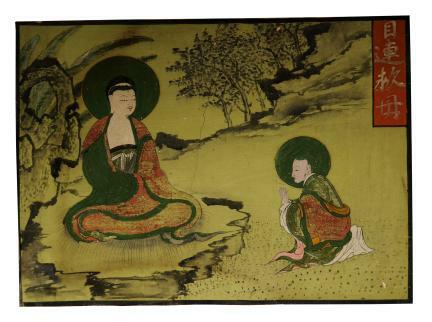 Meanwhile, the ones below them, in the lower wall panels, are from the lives of famous monks. 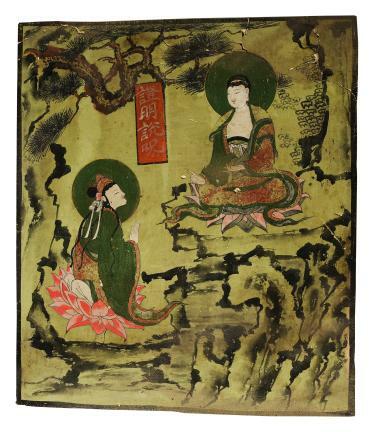 This arrangement in which Buddha-related images are placed above those related to monks is probably meant as a reflection of the hierarchical relationship between the two. 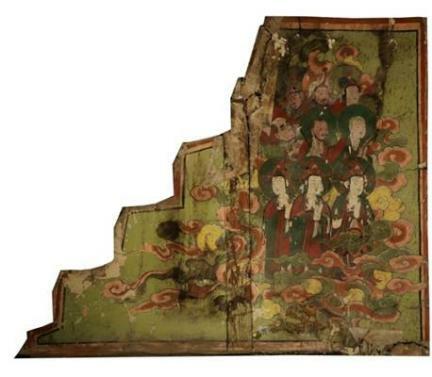 Judging from the brushwork, style of depiction of figures and colors, these murals appear to have been painted around the same time as the Vision of the Bejeweled Stupa mural. 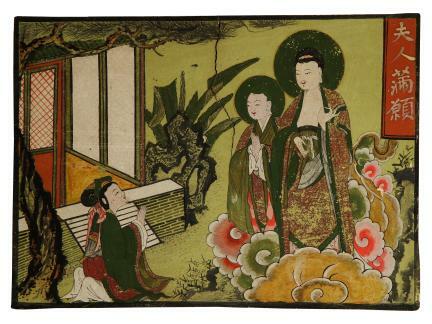 The Sakyamuni-related scenes among the forty-eight murals on the Life and Activities of Sakyamuni Buddha Incarnate are much more varied iconographically than the eight scenes that are most frequently depicted in paintings of the genre known as “palsangdo (Paintings of the Eight Great Events from Sakyamuni Buddha’s Life).” Each scene is, furthermore, accompanied by a title; which is very helpful for their iconographic understanding. The murals of Yeongsanjeon Hall are very different from other early 17th-century Buddhist paintings in several aspects, including the dominance of soft mid-tone colors, detailed depiction of figures and fluid and uninterrupted brushstrokes and the well-balanced composition. 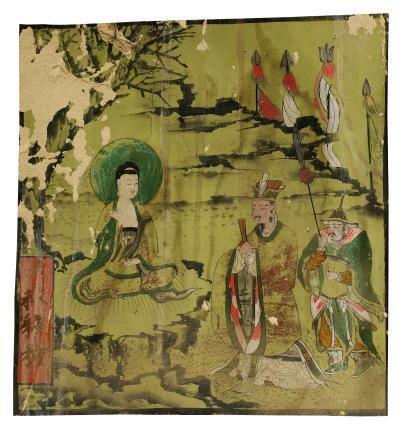 Meanwhile, gathering from information provided in the 1716 record on the renovation of Cheonwangmun Gate and other repair records of Tongdosa Temple, the murals appear to have been painted in conjunction with a series of reconstruction works done between 1714 and 1716, after Yeongsanjeon Hall was destroyed in a fire, in 1713. 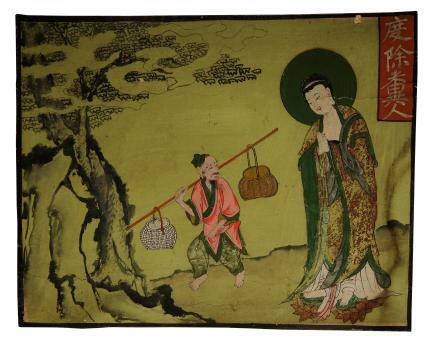 These murals of high artistic merit are also rich in religious feeling and are great mirrors of stylistic leanings in Buddhist painting and more particularly in Buddhist mural painting of the early 18th century.